Using fresh herbs gives a special taste to every meal. Having an indoor herb garden will provide you will fresh herbs all year long. This way you can have your own organic, safe to use herbs. And why not make the garden look fabulous? It can easily become a great decoration for your kitchen. All you need are some interesting herb containers you can make on your own. We will show you how to create low-budget planters for your favorite herbs in no time and by using just a few simple things. 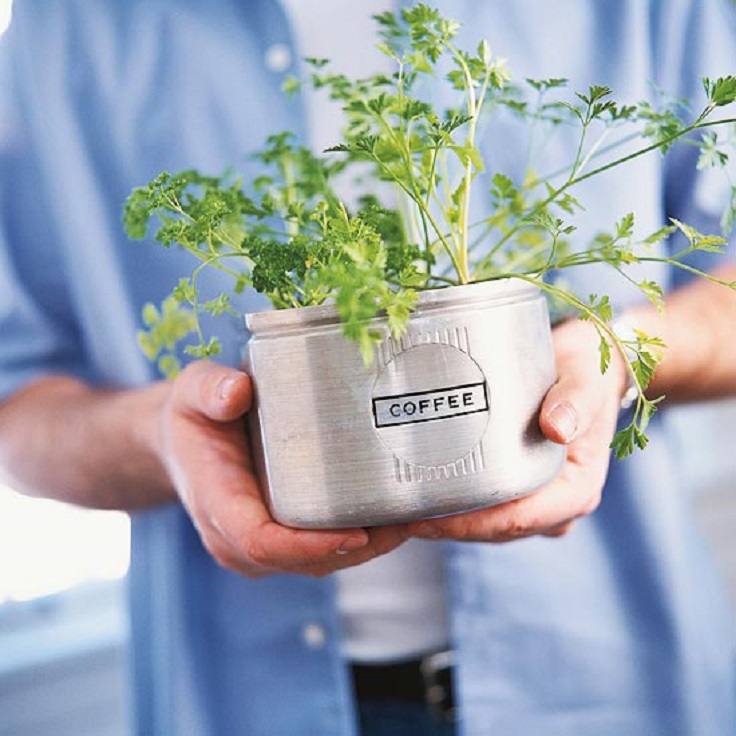 Let these DIY projects inspire you to create your own little indoor herb garden. Vintage teacups can be used for so many interesting projects. You can use them as interesting herb pots for instance. 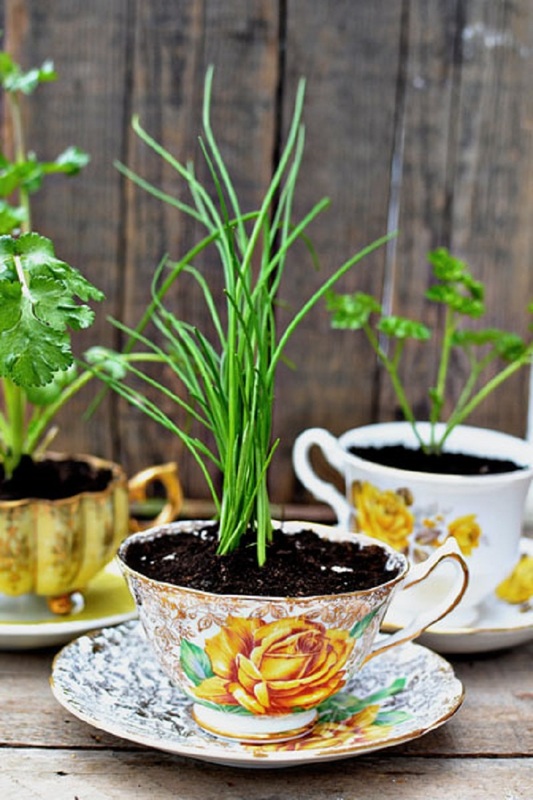 All you need is teacups, potting soil and herbs. The final result is precious and these little cuties can be used as a useful decoration for your kitchen or even as favors for a vintage wedding or mother’s day present. Create a herb garden right on your sunny windowsill. Pick your favorite herbs and some emptied Twinings tea containers. Now get some soilless potting mix and start planting. Water sparingly and use a fertilizer labeled for use on edibles. So vintage and budget friendly! Just how cute are these pint mason jar containers? This herb containers are fun and easy to make. Fill the bottom of the mason jars with pebbles then add the plants. Now make the cute labels with the specific herb’s name and you will have the most fabulous small herb harden ever. Nothing better than a homemade pizza! You have to agree with that. And we have a special project for all of you pizza lovers. How about creating your own pizza garden, made of herbs that are essential for the flavor of your favorite dish. 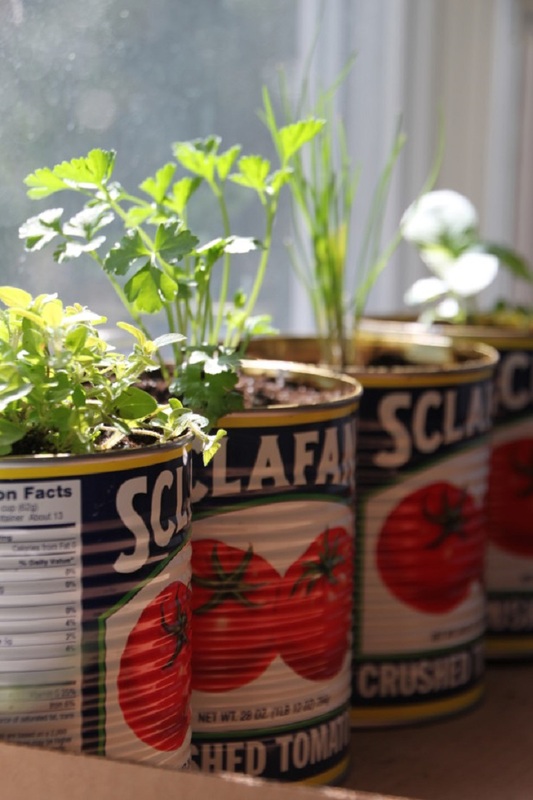 Get some recycled tin cans (from tomatoes for an authentic look) and plant oregano, basil, garlic chives, thyme… Use organic potting soil for controlled quality. 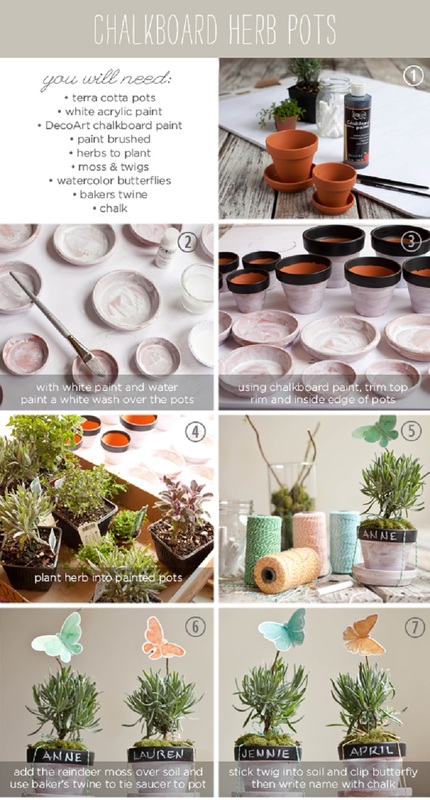 Turn plain terracotta pots into something special using white acrylic paint and DecoArt chalkboard paint. When painted, pot the herbs, add some moss on top and decorate with water colored butterflies on sticks. Write the name of each herb on the chalkboard paint on the upper part of the pot. Beautiful! 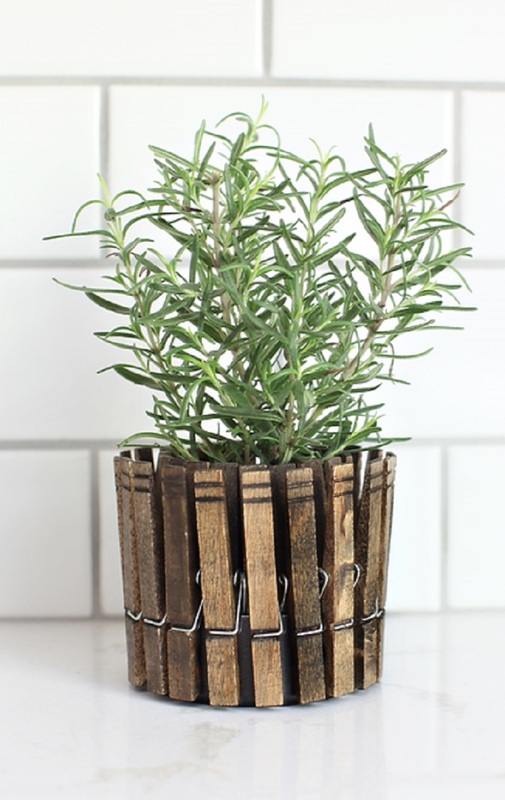 These herb planters have an old, wood look thanks to the clothespin from which they are made. Yes, you can use wooden clothespin to create herb planters that will look great by your kitchen window. You will need a tuna can for the base, clothespin, dark walnut stain marker and oil-rubbed bronze spray paint. 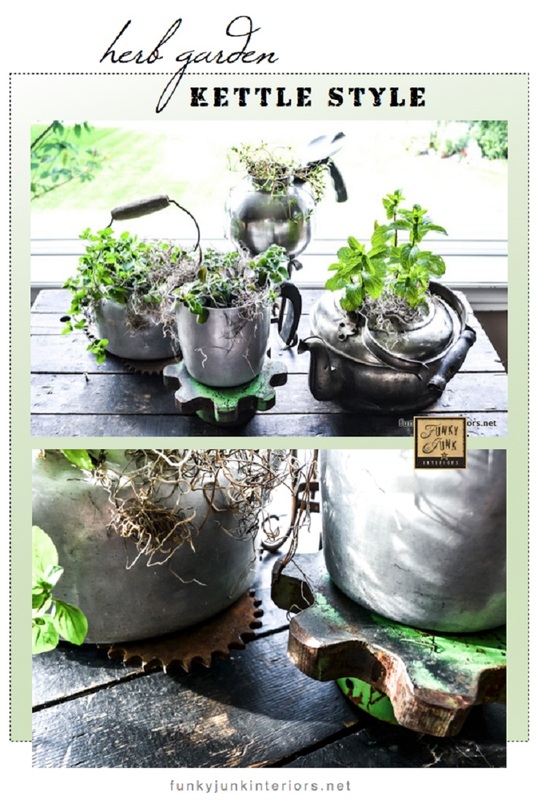 If you want to create an indoor herb garden but don’t have an idea where to plant the herbs why not use some old kettles as planters. When you are finished planting the herbs add some Spanish moss to hide the soil and add texture. 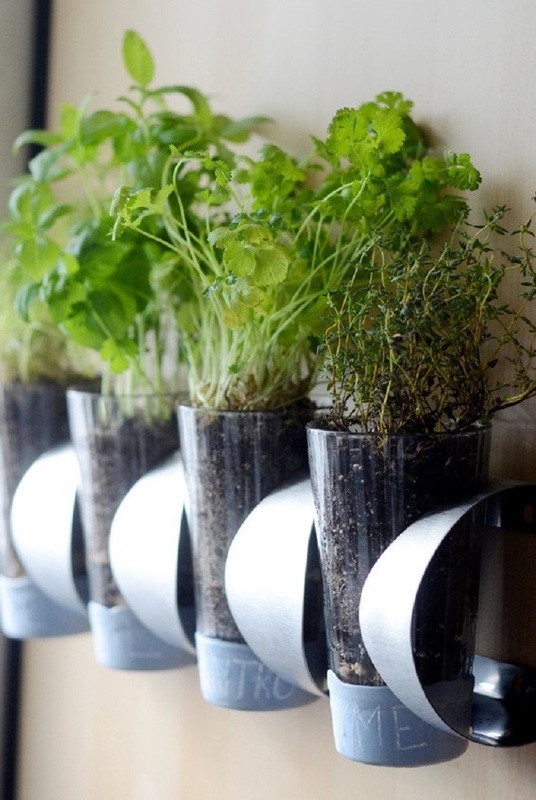 Plant your favorite herbs in your old aluminium kitchen canisters for a cool looking indoor herb garden. Just make sure you drill holes in the bottom of the canisters. Place them on a sunny location and water them regularly – you will have fresh herbs to use in your kitchen throughout the whole year. Here’s a tutorial on how to make a Vurm planter of your very own! You will need IKEA Vurm, 4 herb plants, 4 pint glasses, small rocks, latex pain in color of preference, Americana Clear Chalkboard Coating, white chalk, paintbrush, paper towels and wax paper. Now just follow the detailed tutorial on the link above and you will have a beautiful indoor herb garden. 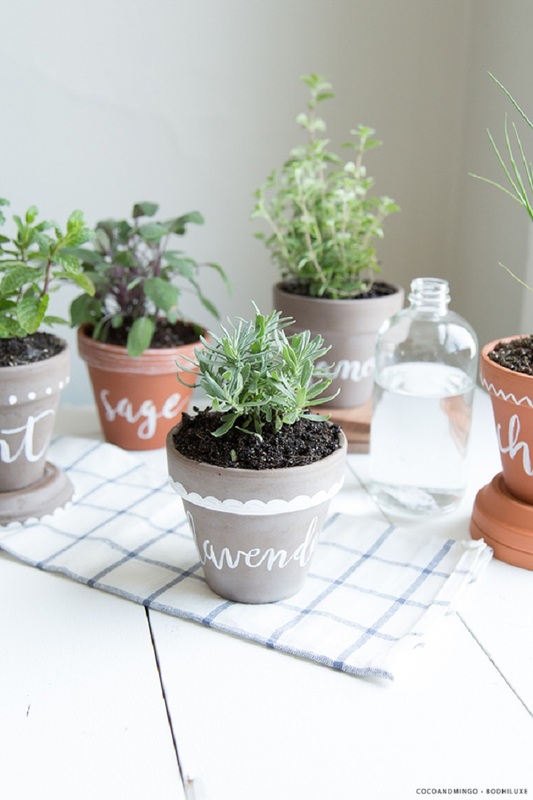 Personalize plain terracotta pots and create the cutest indoor herbal garden ever. You will need some terracotta clay pots, white acrylic paint, paint brushes, herbs and soil. Using the paint decorate the pots with cute patterns like dots for example and write the name of the herb on each one of them. Now plant the herbs and your small herbal garden is ready. Really its an inspiring low budget ideas, i love to do and impliment in my garden, u have done fantastic job with good explanation and illustrations Awesome…. thank u.